The Voice Becomes… Wait for It… Legendary! THE VOICE – Season:16 – John Legend – Photo by Trae Patton/Courtesy of NBC. EGOT winner John Legend will serve as a coach on the upcoming spring cycle of NBC’s four-time Emmy-winning musical competition series The Voice. He will join returning judges Kelly Clarkson, Adam Levine and Blake Shelton, and host Carson Daly. Season 15 of The Voice premieres on Monday, September 24th (NBC, 8/7C). 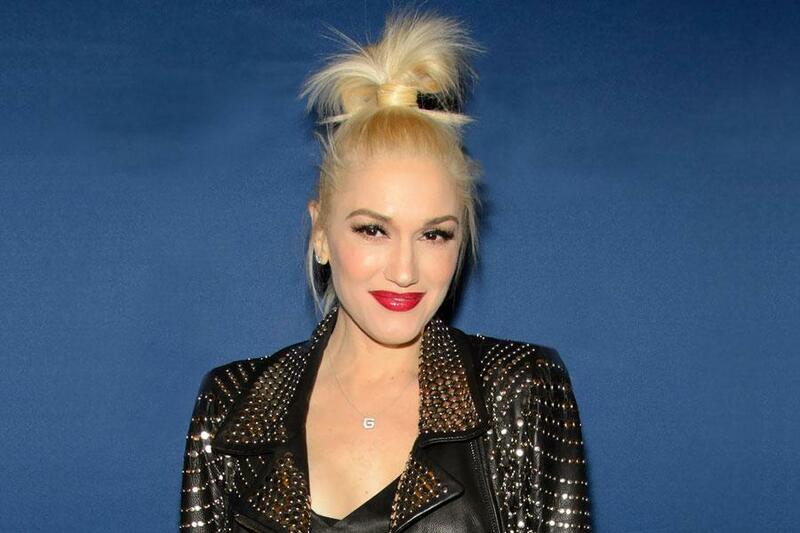 Gwen Stefani Returns To The Voice! Gwen Stefani is returning to The Voice to coach alongside Adam Levine, Blake Shelton and Pharrell Williams in Season Nine. Carson Daly will continue as the show’s host. For more, follow the jump. The Voice Cycle 8 Welcomes Back Christina Aguilera in 2015! When Cycle 8 of The Voice returns in early 2015 – it will be with original coach Christina Aguilera rejoining original coaches Blake Shelton and Adam Levine and relative newbie Pharrell Williams. Details follow the jump. You, Too, Can Sit In The Voice’s Coaches’ Chairs! NBC’s The Voice is introducing The Voice 360: Be The Coach a virtual reality fan experience that could put you in a chair at The Voice’s blind auditions using Oculus Rift Technology. Beginning today, in New York and ending on Monday, September 22nd, The Voice 360 will cross the country with four coaches chairs. 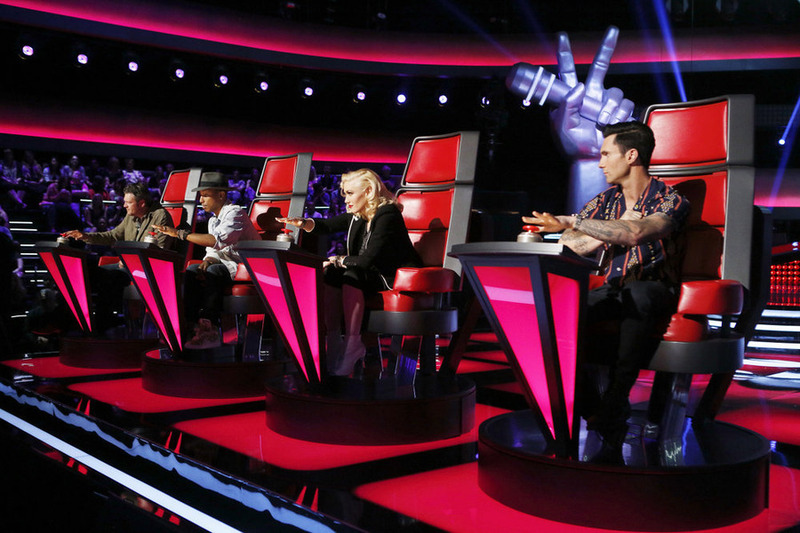 Fans can sit in the chairs and, via a virtual reality headset, see the entire The Voice set and reach out to the coaches seated virtually beside them – Gwen Stefani, Pharrell Williams, Adam Levine and Blake Shelton. For the complete listing for The Voice 360 tour, follow the jump. Swift, Shelton and Florida Georgia Line Lead Nominees For Fourth Annual American Country Awards! Another year, another host of award nominations for Taylor Swift and Blake Shelton. 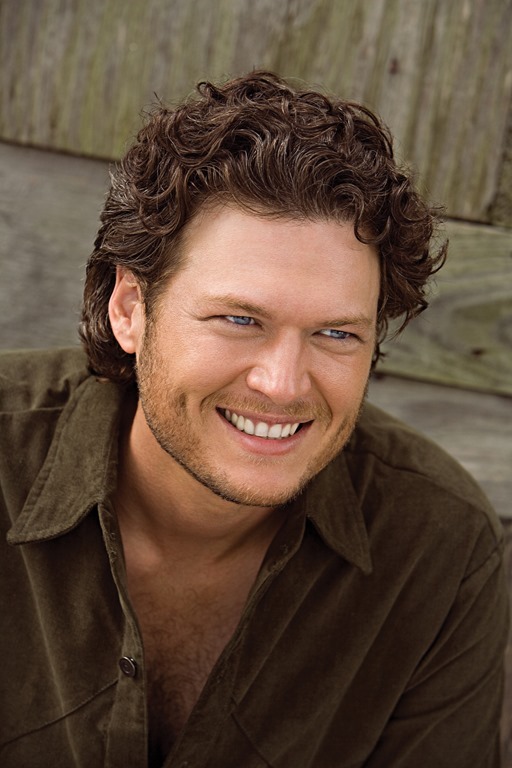 Swift garnered eight noms for the Fourth Annual American Country Awards, while Shelton and Florida Georgia Line each nabbed seven. Fans can vote for their favorite artists online at www.theacas.com, starting today. The Fourth Annual American Country Awards will be hosted by Trace Adkins and Danica Patrick. The awards will be broadcast live from Mandalay Bay in Las Vegas, on Fox, on Tuesday, December 10th (8/7C). The complete list of nominees follows the jump. 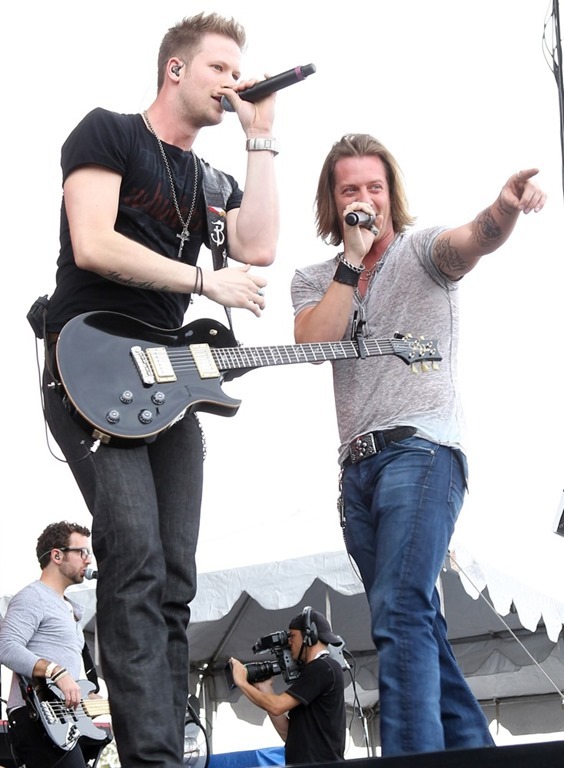 Swift and Musgraves Lead CNA Awards Nominations With Six Apiece! The 47th Annual CMA Awards nominees were announced this morning and, to no one’s surprise, Taylor Swift with six and Blake Shelton with five were among the leading nominee-nabbers. An actual surprise might be first-time nominee Kacey Musgraves, who was nominated for six awards – tying Swift and leading Shelton by one. 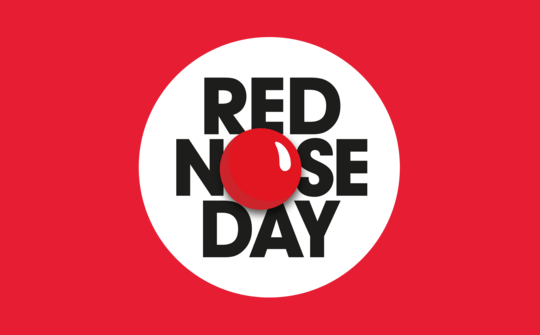 The press release – with the complete list of nominees – follows the jump. The 47th Annual CMA Awards will be broadcast live, Wednesday, November 6 (8:00-11:00/7:00-10:00C) on ABC. 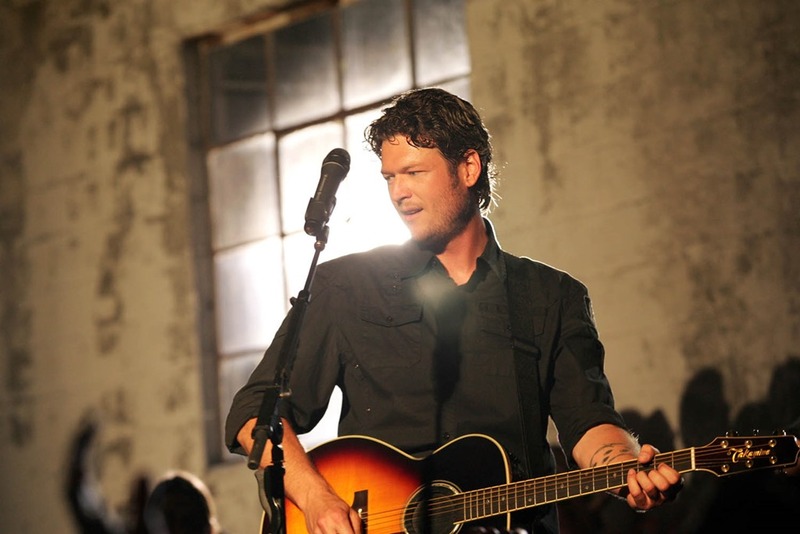 Blake Shelton Organizes Benefit Concert For Disaster Relief in Oklahoma! Blake Shelton has organized Healing in the Heartland: Relief Benefit Concert – a benefit concert to raise funds to fund relief efforts in Oklahoma following the destruction wrought by tornadoes in Monroe earlier this week. Miranda Lambert, Vince Gill and Reba will also perform. The concert take place at Chesapeake Energy Arena in Oklahoma City on May 29th and will be televised live at 9 p.m. ET/PT on NBC. It will also air on cable networks Style, G4, Bravo, E! and CMT on either a live or delayed basis. Tickets will go on sale on May 25th at 10am CT.
Read the press release following the jump.